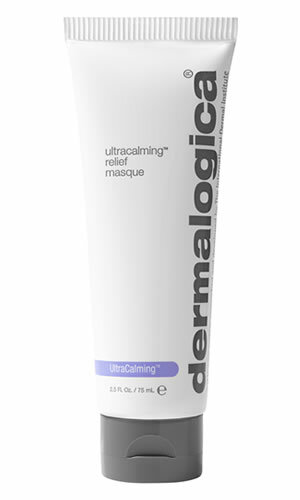 A powerful, ultra-calming treatment masque enriched with Colloidal Oatmeal to help soothe enraged skin and provide lasting relief from sensitized skin flare-ups, redness and rosacea. Apply generously to cleansed face and throat or areas with or prone to sensitivity (e.g. ; cheeks or eye areas). Allow to process at least ten minutes to fully activate. Gently rinse with warm water. Apply 2-3 times per week or whenever skin requires a soothing remedy. Follow with UltraCalming Mist and UltraCalming Serum Concentrate. Contains our exclusive UltraCalming Complex to help reduce sensitivity, redness, irritation and inflammation. Mushroom extracts help reduce short and long-term skin inflammation and redness. Bisabolol helps soothes and calms irritated skin. Acetyl Tetrapeptide-15 targets neurosensitive skin by reducing painful sensations. Boerhavia Diffus (Red Hogweed) Root Extract helps target neurogenic inflammation, restores tissue integrity and soothes to restore skin's normal sensitivity level for immediate and long-lasting effects. Avena Sativa (Oat Kernel) extracts with natural anti-irritant and anti-redness properties. Ginger Extract and Bisabolol work synergistically to help reduce redness and irritation. A soothing, hydrating mist that can help relieve sensitivity while calming redness, stinging and aggravated skin.